Thanksgiving rates at the top of my favorite holidays list, not because of fond childhood memories as our family wasn’t much for big family gatherings or nostalgia tinged reflection on historic tradition. There is just something special about the concept of setting aside a day to take a deep breath and reflect on how fortunate we are. Now you know why we refuse to partake in the Black Friday related madness. Over the course of several decades, my dearest friend and I have gathered quite a treasure chest of fond Thanksgiving memories. This year we combined the very best of what makes any holiday special; a bit of a road trip, a little adventure, and very good food all shared with friends. As a bonus, the weather was near perfect with clear blue skies and cool temperatures. We kicked it all off by picking up Sylvia and Bernhard at their hotel in Kingman and then heading north on Stockton Hill Road along the foothills of the Cerbat Mountains through the Hualapai Valley. 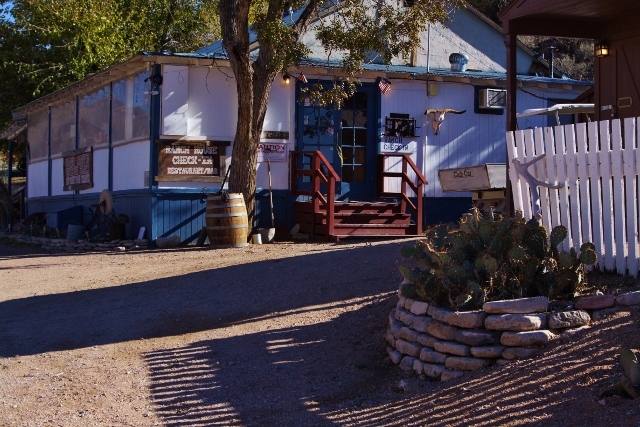 Our destination was Grand Canyon Western Ranch, a dude ranch that is steeped in history, for some good traditional food, and a bit of serenading by Cowboy Dave. Oddly enough, more years ago than I care to count, when this was a working cattle ranch, I worked there for a short period of time. Thanksgiving is a day for reflection. The conversation and laughter flowed easily as we discussed Route 66, travel and its challenges, language related bloopers, and food. Of course the pending European Route 66 Festival that is scheduled to take place in Germany next was also a subject of eager discussion. My only regret with holidays such as this is that they end far to quickly. This Thanksgiving was no exception. Our holiday weekend will continue through Sunday. Toshi Goto may be stopping in Kingman for dinner, and there is a birthday celebration for our son. So, it will be a most memorable holiday weekend indeed. Now, lets talk about a few coming attractions, both good and bad. First, on December 2, at 5:30 PM, the Kingman Downtown Merchants Association has facilitated a meeting with the the church that is looking to utilize the historic Central Commercial Building, the very cornerstone of the revitalization of the cities historic commercial district. Obviously this is a rather contentious issue. It is also one that, regretfully, seems to be indicative to the Walmart approach to Christianity that is the American corporate church. I will keep you apprised of developments. Next, the Route 66 Association of Kingman will be hosting a reception for local car clubs that have played such an important role in the development of a sense of community this past year. This is another manifestation of the associations leadership in regard to the transformation of the historic district and the Route 66 corridor. The self publishing endeavor continues (thank you Mr. Keppel). The struggle now is in regard to the ebook version of Jim Hinckley’s America, volume one. I am truly hoping to have this finalized within the week. Meanwhile, the print version is currently available on Amazon.com. 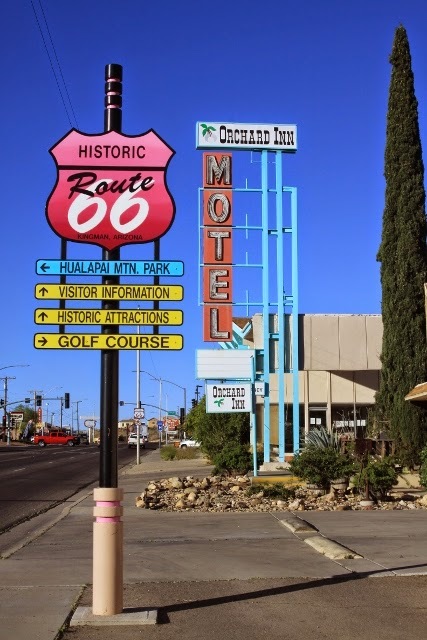 On January 16, at Beale Celebrations in downtown Kingman, I will be making a Route 66 presentation. This will be a fund raiser for the Route 66 Association of Kingman’s neon sign renovation project. Tentative plans are for this to be followed by a Kingman Downtown Merchants Association sponsored pub crawl. For more information or tickets contact Just Marketing as seating will be limited. After weeks of intense negotiations I have accepted a new book contract. The general topic is the Route 66 renaissance. I will provide a few details soon as your input would be greatly appreciated. To gather images for the new book we will be traveling to California in late January. Ideally we can also attend an organizational meeting for the 2016 90th anniversary Route 66 festival being spearheaded by Scott Piotrowski. Last but not least, there are two more projects simmering on the back burner. One is a book on two lane adventures in New Mexico that will be a joint project with photographer Kerrick James. The second is another self published title; Bathtubs, Birdcages and Chevrolet. Would anyone care to guess the subject mater or the origins for the title?